Dave - thanks for this write up. I have used the GoLite Pinnacle in the past and plan to purchase a Jam in the near future. What appeals to me about the GoLite packs is their balance of weight/features/comfort and the scales tip just in their favour for me, especially at the price. I agree that the packs, by their very design, have a definite weight limit. The first day of my 4 day Hardanger trip wasn't the most comfortable as I adapted to a brand new, untested pack, fiddled with the straps and fit and realised that I'd packed too much stuff! Once I'd found the optimum strap configuration I found the pack very comfortable. The hip belt pockets and side pockets are brilliant. Perfect shape, size and position. The rear pocket I'm less happy with. I think GoLite should have gone for a stretchy mesh pocket for drying or carrying just a couple of items of clothing. I think there is a tendency to use it as additional volume to the main compartment and I agree that this can shift the centre of gravity away from the body too much. Maybe I just need to be stricter about what goes in that pocket! I've modded my Pinnacle quite a bit. I've removed the hydration sleeve, key ring thingy, Compak-tor thingys, one ice-axe attachment and cut about 3 feet of excess strap material off! I plan to do the same mods the the Jam. The quest for the perfect backpack continues! When someone offers a full custom service for backpacks then we'll all have access to the perfect backpack. If we can afford it! Until then the GoLite packs, with a little scissor work, represent the best value option for me. Holdfast-Yeah, I've wondered if my experience on the first long day was simply about getting used to the Jam and there might be something in that notion. 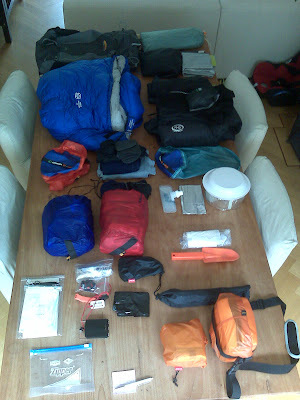 Four days with a pack is pretty thin and perhaps not enough to arive at a fair conclusion. I can't see how the hip belt as-is can function properly under big loads whichever way I pack. Still I won't be shelving the pack, just being less ambitious with it for a while. Perhaps I'll change my opinion in time (that's what opinions are for right?) but for the time being I'll reach for the Granite Gear (I'll be doing some mods to see if I can address the niggles with that pack). I'm glad you get along with the pinnacle and if Martins experience is anything to go by you should get get along with the Jam too. Like I said, there's a lot good about these packs and if you're lucky enough that they suit you then they make for good, hard wearing, lightweight packs at a bargain price. Like the sound of your mods by the way. Will have to have a go at mine. First to go will be the comPaktor thingies!! The Pinnacle has thicker shoulder strap padding and the hipbelt seems a bit thicker. I always pack the Pinnacle and Jam tall and thin. Keeping the weight close as possible to my centre of gravity is key. I love the packs. I have used so many other packs but the Pinnacle is stunning and my number one for week plus walks. The Jam is a great over night pack. Plug away with it. Could work out well in the end. On weight I don't know the perfect answer. I found it OK with testing different loads up to 12Kilo. Others don't and some say more. Holdfast that is radical with all that trimming bits of. How much weight is saved of the pack now? Absolutely guys, certain packs suit certain body shapes and I have also only used my Pinnacle for a single four day trip, so my experience is limited. I'll be honest and admit that my OMM Villain is a slightly more comfortable pack under full load, but only by a tiny margin and it weighs a lot more. Also a couple of the design features on the Villain aren't as well done as the GoLite. Side pockets and hip belt pockets may seem like minor considerations but when you're wearing your pack all day it's these minor storage solutions that can prove to be decisive. These little pockets on the Pinnacle are just perfect. And for the price? I think the Jam and Pinnacle should be regulation issue to anyone heading down the lightweight backpacking path. As for the mods, some of them were no brainers. From what I could tell the Compak-tor thingies were to reduce the volume of your pack into a day-pack. Yeah, that was never going to happen so SNIP and they were gone. Same for the hydration sleeve, don't use one on backpacking trips so SNIP. Ice axe loops? Only need one, SNIP. Key-ring keeper? SNIP! Not sure how much I've saved in weight. When I unpack this week I'll weigh my hot-rodded Pinnacle. I reckon 3oz saved. Despite being on my second Jam, I cannot disagree with your comments. The Jam is good enough, but my heaviest packs are more comfortable. I used mine for a series of four day loops in the Pyrenees and it got the job done. I have never weighed it so cannot say what I would consider its maximum weight. For me, its comfort becomes an issue towards the end of very long days (> 25 miles) but the Jam goes a long way to making those days possible. With my battered, older Jam I use the pocket for tools and other sharp edged items while mountain biking. I'm not sure why Golite dropped from a 3 litre hose system to a 2 litre system because I can certainly get through 3 litres on a big day in a dry place. Once or twice, I've needed 6 litres. Chris Townsend said the Jam wasn't particularly waterproof. He will not have said that if he hadn't had water ingress. Perhaps I've been lucky because my second Jam has seen some very wet conditions and performed well - but it's the last model, not the one with belt pockets. You are also correct about what the compression straps do to the back panel. The Jam has faults but none so drastic as to make me feel I must buy a new pack, even though ULA owners rave about comfort and MLD owners go and on about the build quality. "The Jam has faults but none so drastic as to make me feel I must buy a new pack"
I might feel the same if I'd started out with the JAM but I've got the Granite Gear pack on my gear shelf already. With you all the way with the Vapour Trail. Had mine for about 5-6 years now, and have made one or two modifications on it along the way. depending on how long my walk is but easily carries up to 15=18 kgs. I am down to 10-12kgs +food and water. carries it no probs. Haydn, best pack I've ever owned. It's beginning to get a bit worn now (few holes in the bag) but I'll be very reluctant to retire it. Really not sue what I'd replace it with.